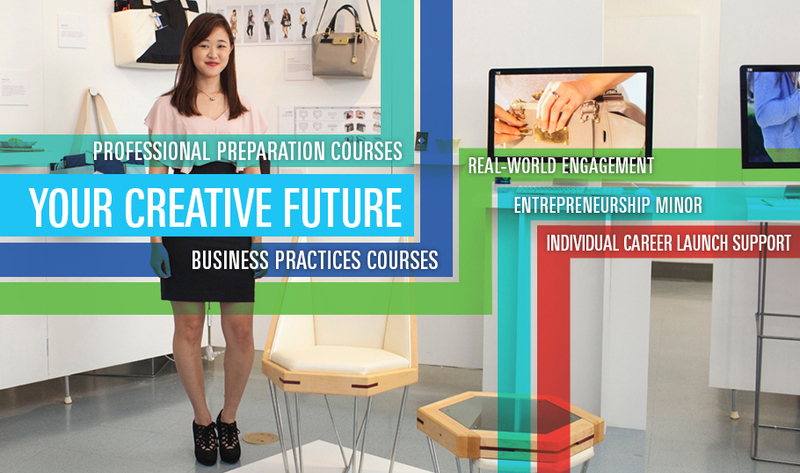 Your Creative Future is a signature career preparation initiative at the core of an Otis College education. Students learn practical, professional, and related business skills that empower them to successfully move from College studies into thriving professional careers. Your Creative Future builds on the courses, degrees, and services that the College provides, and expands current offerings to include new courses, a curricular pathway to entrepreneurship, and an even more individualized education. Students benefit from new course offerings within the Liberal Arts and Sciences curriculum that teach business skills tailored for artists and designers, including business planning, basic accounting, principles of finance, cost structuring, taxation, invoicing, and more. Through these specialized courses taught within each Major, students gain industry-standard skills in portfolio development, presentation delivery, collaboration, client/collector relations, negotiation, ethical awareness, project management, and more. Students engage with outside partners and organizations through our renowned Creative Action program, Internships, and Travel Study opportunities. In addition, Otis College presents annually several distinguished lecture series and workshops, which provide opportunities for students directly to interact with leading thinkers and makers of our time. Launching a career begins well before graduation, and Otis College provides numerous resources to support students and alumni at every step. Each semester, students meet with a faculty Academic Mentor to focus on goal-setting, explore career options, and receive individualized recommendations. The Career Services office provides specific guidance on résumé and cover letter writing, interviewing skills, and presentation development. Career Services also connects students and alumni to internship, freelance, part-time, and full-time employment opportunities through a vast online job board featuring over 2,600 employers. Building on the required Business Practices course, interested students can dive deeper into the world of start-ups, small businesses, and solopreneurship through a new Minor in Entrepreneurship. This new curricular program complements any Major field of study, and supports participants in forming their own studio, developing their work, services or products, and marketing themselves for visibility, recognition, and success.